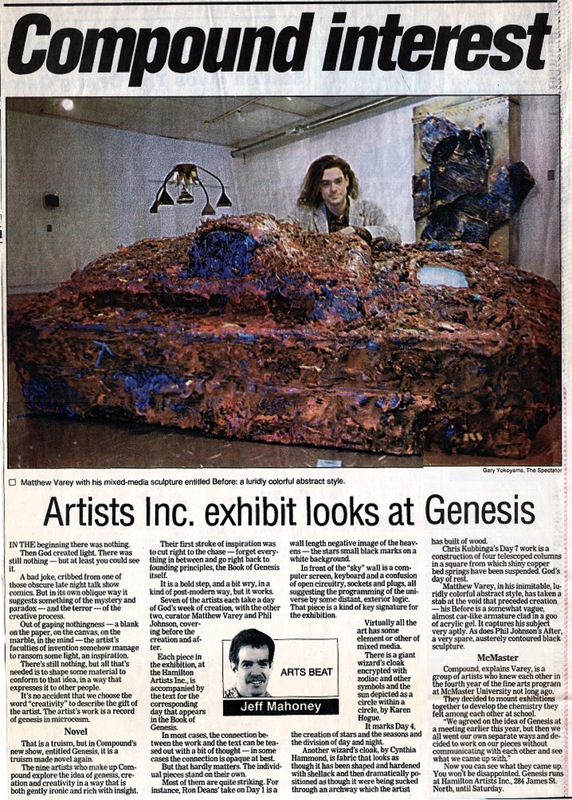 I graduated from McMaster University in 1993, but the previous year participated in the graduating exhibition of 1992, as by then I had finished all my studio arts courses. 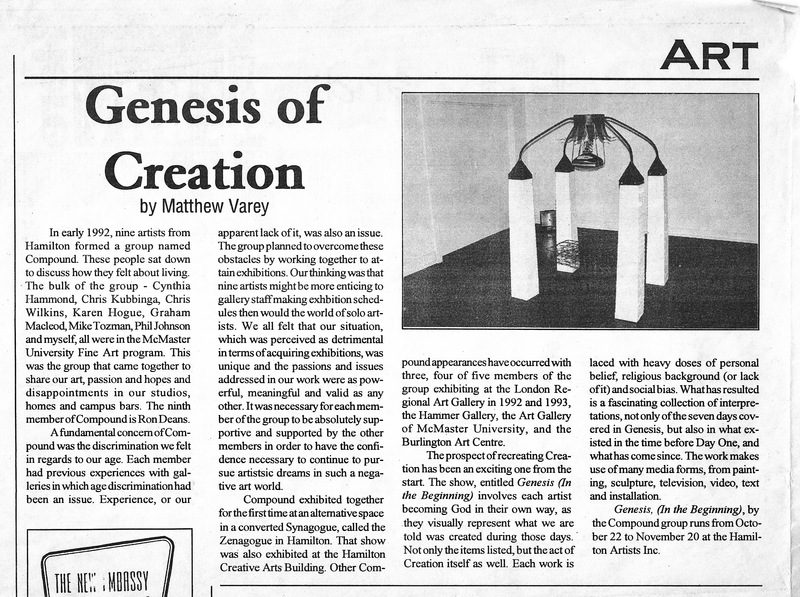 That spring, as we hung our graduating exhibition (Summa Exhibition, McMaster University Art Gallery, April 1992), a group of us created an artists’ collective in order to remain in touch, remain active, and ambitious. All of us were interested in colour, scale, sculpture, or the sculptural potential of painting. We called ourselves Compound. 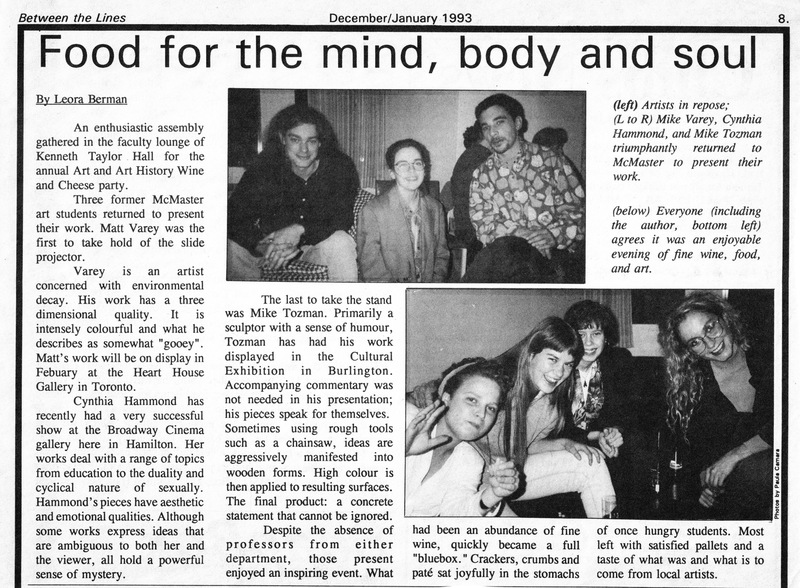 One of the prime movers in this group was Matthew Varey, whose determination to make a career as an artist was inspiring – he had had several solo exhibitions under his belt before even finishing his degree, and always believed that we were individually and collectively capable of making it in the art world. 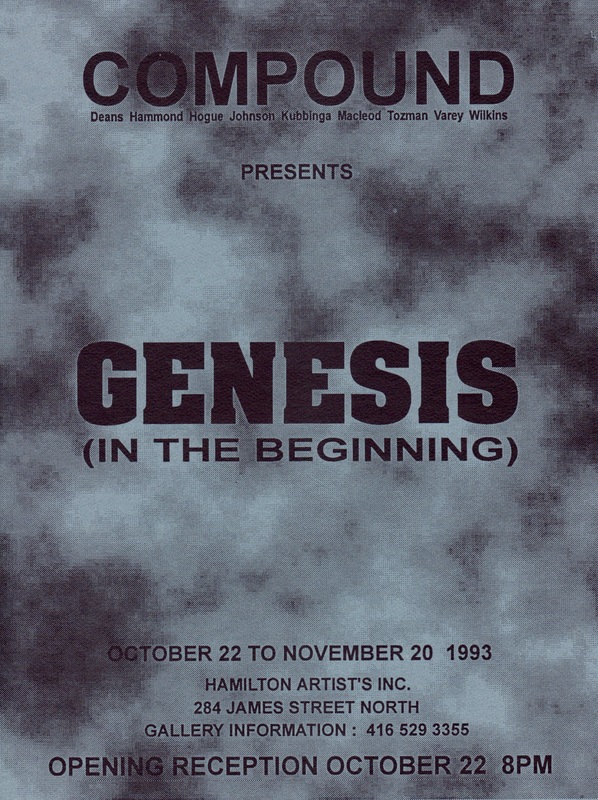 Matt had paid close attention to the artists’ scene that had emerged in London, Ontario, in the 1960s, and felt confident that we could be part of something similar in Hamilton/the Golden Horseshoe. 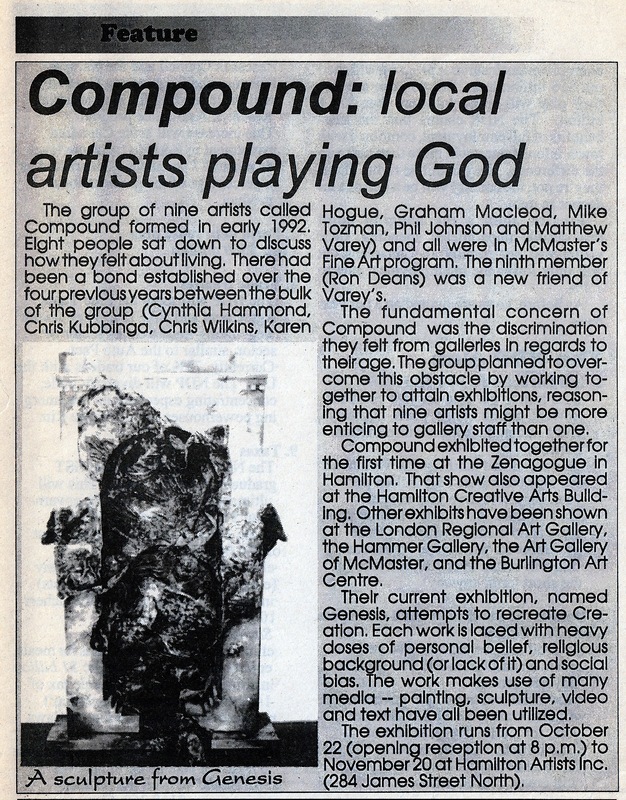 The members of Compound were (alphabetically) myself, Karen Hogue, Phil Johnson, Chris Kubbinga, Graham Macleod, Mike Tozman, Matt Varey, Chris Wilkins, and later, Ron Deans, the only member not to have been part of our cohort at McMaster. 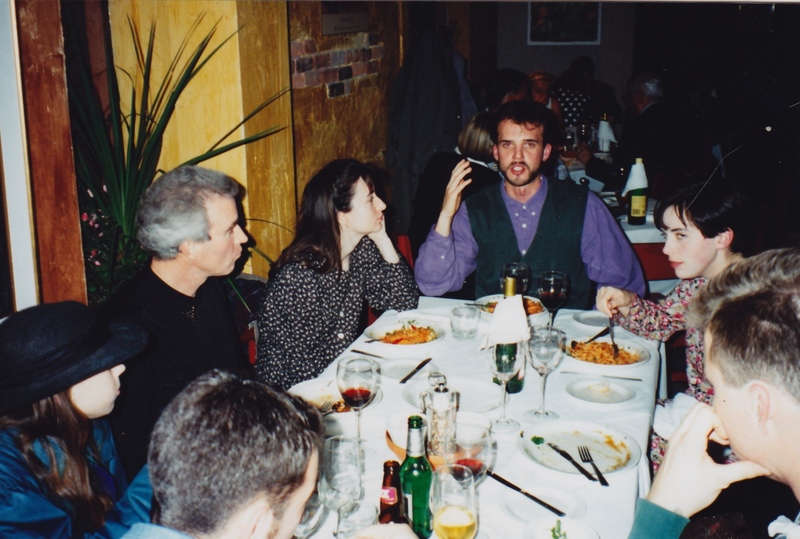 The members of Compound sharing a meal after our first exhibition opening in 1992. Right to left: Chris Kubbinga (probably), Cynthia Hammond, Chris Wilkins (saying something smart), Karen Hogue, Ron Deans, Ron’s daughter, and Mike Tozman. Photo: Matt Varey. Matt encouraged as much as he inspired, and through his chutzpa our group, or various permutations thereof, had a series of exhibitions in a fairly short period of time, at Hamilton venues such as the Zenagogue, the Hamilton Creative Arts Building, the Hammer Gallery, the Hamilton Artists Inc., and also the London Regional Art Gallery, and the Burlington Art Centre. Compound’s work was noticed, and the following reviews and announcements from 1992-93 are evidence of the ripple effect of our collective efforts. The above article pictures the work I made for this particular exhibition, Firmament, acrylic, fabric, wood construction, wire, 5 x 2 x 8′,1992. Many of us exchanged works so that we would each have something made by the others. 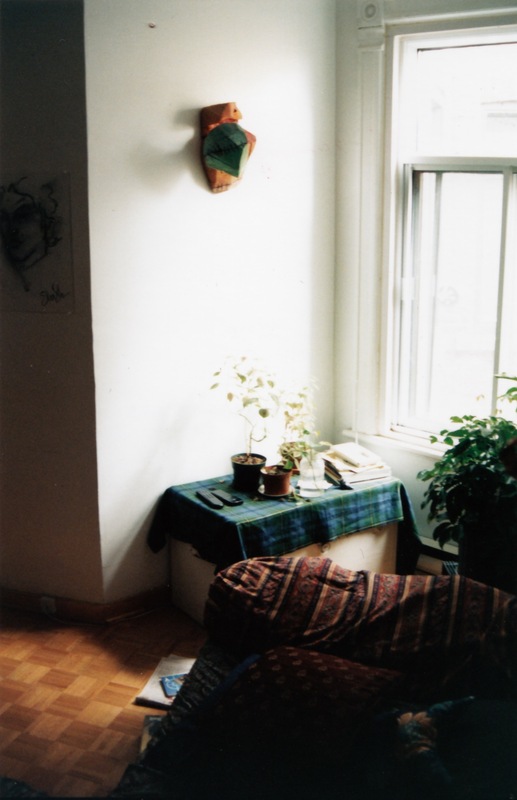 Until one of my many moves proved too much for it, a sculpture by the very talented and philosophically-minded Mike Tozman hung in my apartments in Hamilton, Montreal, London (Ontario), Ottawa, and again in Montreal. His is the green, blue, and peach creature with a long horn/tentacle/sprout/spike reaching out into the surrounding space. 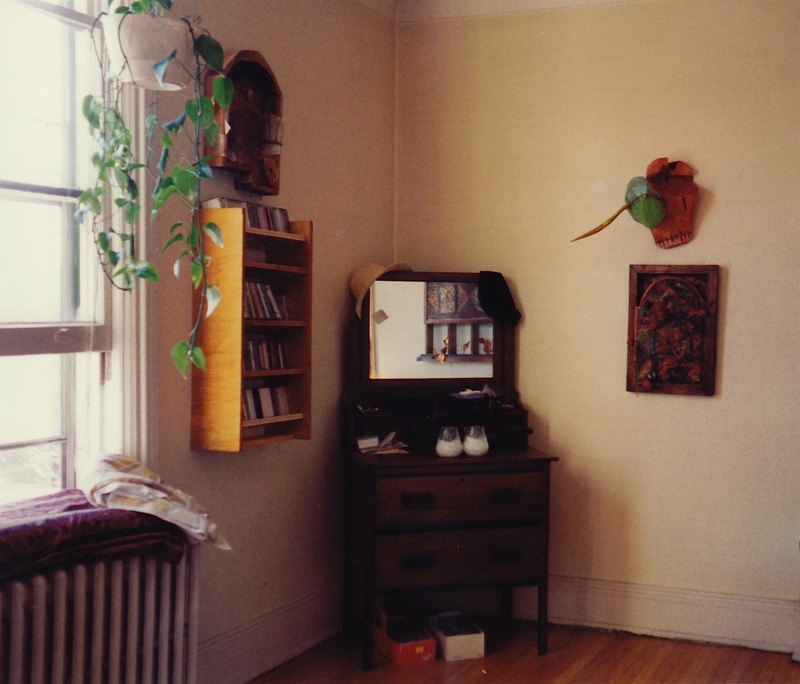 … and the same work, minus the tentacle, in my 1995 apartment on Rue St-Dominique, Montreal, in 1995.